Daniel discussed the limits of Privacy with James Graham (Privacy), Jon Ronson (journalist and author of So You’ve Been Publicly Shamed), and Sherry Turkle (professor and author of Reclaiming Conversation: The Power of Talk in the Digital Age) yesterday during Public Forum's A conversation about Privacy at The Public Theater in New York. Update: 12th August 2016. A video. Daniel Radcliffe on Disconnection as Social Rebellion. Some Tweets and retweets by @PublicForumNY can be read below (you can also read tweets via Storify). A few clips will be shared over the rest of the week. When those are online I'll add them below too. 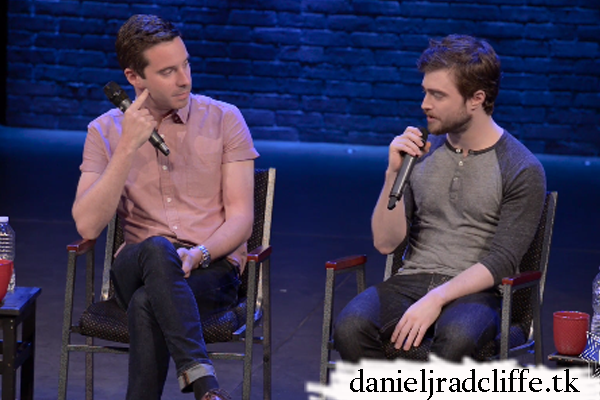 Joining Michael tonight is @jonronson, @STurkle, @mrJamesGraham, and Daniel Radcliffe! Rounds of applause for every member of the panel - this crowd is EXCITED!
. @mrJamesGraham talks about the genesis of Privacy (the play) - from its U.K. origins to its U.S. version. HA! Daniel and @mrJamesGraham “coincidentally” wore the same thing to the opening of PRIVACY. Who’s playing who on what stage?!? Daniel points out that audiences LOVE seeing their stuff up on screen during the show - despite it being an invasion of privacy, ostensibly. There are services now that help you bury/hide/destroy things online - to beat the Google algorithm, for example. Daniel mentions how not having an email address is now, weirdly, a kind of major individual rebellion. Think about THAT for a minute. Companies can BUY your data. And there’s nothing in place to prevent it - or worse things. Feels a little like a horror movie, doesn’t it?